With "Panic Room", "Fight Club" director David Fincher brilliantly executes what is perhaps the most refreshing take on the "Die Hard" genre since "Speed". Typical to the genre, where an Average Joe takes on a defined number of terrorists within the confines of a defined piece of real estate, "Panic Room" places a woman in jeopardy after three men have broken into her house. However, instead of having to rely on military training or heavy ordinance to save the day, the reluctant heroine must use her wits to outsmart the interlopers, who are just as resourceful, making "Panic Room" one of the most unique and superbly executed suspense-thrillers in recent years. The film begins with the recently divorced Meg Altman (Jodie Foster of "Anna and the King", playing the role that Nicole Kidman had to bow out of due to a knee injury) and her impertinent teenage daughter Sarah (Kristen Stewart) moving into a spacious townhouse in New York's Upper West Side. During this first half-hour, the audience becomes privy to the layout and amenities of their new home, which includes the titular 'panic room', a 'safe room' completely encased in steel into which the owner can retreat during a home invasion or natural disaster. Unfortunately, the panic room is put to the test on the first night after the two women move in after three men break into the house in search of $3 million that was left behind by the previous owner. Thankfully, Meg is able to wake up in time to notice the intruders, and she quickly retreats into the panic room with Sarah. From the panic room, Meg is able to view every inch of the house courtesy of strategically placed surveillance cameras, as well as speak to her would-be robbers through a P.A. system. Unfortunately, the panic room's dedicated phone line has not been hooked up, so she cannot call the police. Meanwhile, on the outside, the intruders must come up with a way of 'encouraging' Meg and Sarah to come out of the panic room, which is where the stash is hidden. However, it becomes very apparent that there are some significant differences among the trio in terms of how to proceed. Burnham (Forest Whitaker, who directed "Hope Floats") knows everything there is about the panic room, being an employee at the security company that built it in the first place, and is against the use of violence. His volatile and not-so-bright partner, Junior (Jared Leto of "Requiem for a Dream"), has brought along heat-packing Raoul (country-singer-turned-actor Dwight Yoakam of "Sling Blade"), a man of few words and even fewer principles. And so begins a series of moves and countermoves in a high-tension cat-and-mouse game between the two women and the three intruders. Among the twists and turns during this heart-pounding 90-minute section of the film: Burnham tries to force the women out by pumping propane into the room, only to have the tables turned on him by a resourceful Meg; Sarah finds a ventilation duct from which she can send SOS by flashlight to a sleeping neighbor (Andrew Kevin Walker, the screenwriter who worked with Fincher on "Se7en"); and a ticking clock is introduced with Sarah suffering from diabetes and in desperate need of a glucagon injection before succumbing to hypoglycemic shock. The film is also blessed with some moments of unexpected humor, such as a loudspeaker exchange between Meg and the intruders where Sarah makes some suggestions on the use of colorful language, or the dry comments uttered by Raoul. Despite being limited to the confines of a single house and so few characters, scribe David Koepp ("Stir of Echoes") creates a character-driven thrill machine that easily captivates audience interest from the very first scene. And though there are some logical gaps and leaps of faith in "Panic Room", there are also some genuine surprises thrown in, the type that make you ponder, "Why didn't I think of that?" The script also rightfully steers clear of the typical mano-a-mano combat that is so typical of the "Die Hard" genre and would make very little sense in this film, where it is all about brains over brawn. 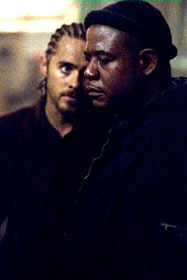 Fincher, whose reputation for dark and edgy films ("Se7en", "Fight Club") precedes him, dresses Koepp's taut script with the style that his fans would expect. Courtesy of some inventive cinematography and the use of CGI, the omniscient camera effortlessly captures the action throughout the house, creating leisurely tracking shots that seamlessly pass through floors, walls, railings, and even keyholes. The role of Meg, a smart and sympathetic heroine, is certainly not a stretch for Foster, whose resume includes a number of strong female roles. Stewart is also good as the mouthy Sarah, who gradually lets her guard down as the impending peril brings her closer to her mother. Among the villains, Whitaker's Burnham is perhaps the best fleshed out, a working class man who becomes increasingly conflicted as what was supposed to be an easy score becomes more complicated and dangerous. Leto's Junior sports the stereotypical combination of being volatile and dimwitted, while Yoakam's Raoul is the wild card who becomes increasingly menacing as the situation escalates. Of all the 2002 films released so far this year (many of which have been downright disappointing), "Panic Room" is certainly a standout and is an early contender for the year's top ten. Unfolding as a high-stakes chess game, played out with some well-written characters, and executed with visual flair, "Panic Room" is a smart and innovative entry into the well-tread "Die Hard" genre. During this spring moviegoing season, be sure to make some room in your schedule for "Panic Room". Images courtesy of Sony Pictures Entertainment. All rights reserved.